The liver is a peritoneal organ positioned in the right upper quadrant of the abdomen. It is the largest visceral structure in the abdominal cavity, and the largest gland in the human body. An accessory digestion gland, the liver performs a wide range of functions; including synthesis of bile, glycogen storage and clotting factor production. In this article, we shall look at the anatomy of the liver – its position, structure, and neurovascular supply. The liver is predominantly located in the right hypochondrium and epigastric areas, and extends into the left hypochondrium. When discussing the anatomical position of the liver, it is useful to consider its external surfaces, associated ligaments, and the anatomical spaces (recesses) that surround it. 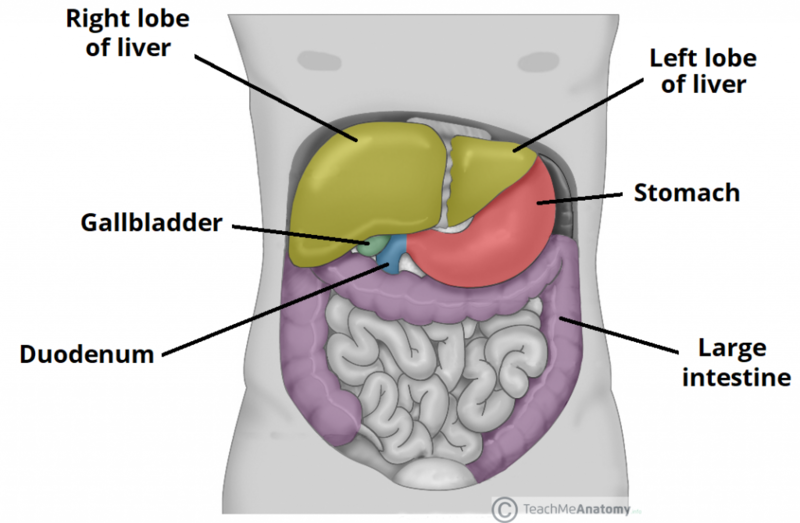 Fig 1 – The liver lies in the right hypochondrium of the abdomen, and is surrounded by numerous organs. Diaphragmatic surface – the anterosuperior surface of the liver. It is smooth and convex, fitting snugly beneath the curvature of the diaphragm. The posterior aspect of the diaphragmatic surface is not covered by visceral peritoneum, and is in direct contact with the diaphragm itself (known as the ‘bare area’ of the liver). Visceral surface – the posteroinferior surface of the liver. With the exception of the fossa of the gallbladder and porta hepatis, it is covered with peritoneum. It is moulded by the shape of the surrounding organs, making it irregular and flat. It lies in contact with the right kidney, right adrenal gland, right colic flexure, transverse colon, first part of the duodenum, gallbladder, oesophagus and the stomach. There are various ligaments that attach the liver to the surrounding structures. These are formed by a double layer of peritoneum. Falciform ligament – this sickle-shaped ligament attaches the anterior surface of the liver to the anterior abdominal wall and forms a natural anatomical division between the left and right lobs of the liver. The free edge of this ligament contains the ligamentum teres, a remnant of the umbilical vein. Coronary ligament (anterior and posterior folds) – attaches the superior surface of the liver to the inferior surface of the diaphragm and demarcates the bare area of the liver The anterior and posterior folds unite to form the triangular ligaments on the right and left lobes of the liver. The left triangular ligament is formed by the union of the anterior and posterior layers of the coronary ligament at the apex of the liver and attaches the left lobe of the liver to the diaphragm. The right triangular ligament is formed in a similar fashion adjacent to the bare area and attaches the right lobe of the liver to the diaphragm. Lesser omentum – Attaches the liver to the lesser curvature of the stomach and first part of the duodenum. It consists of the hepatoduodenal ligament (extends from the duodenum to the liver) and the hepatogastric ligament (extends from the stomach to the liver). The hepatoduodenal ligament surrounds the portal triad. In addition to these supporting ligaments, the posterior surface of the liver is secured to the inferior vena cava by hepatic veins and fibrous tissue. Fig 2 – Diaphragmatic surface of the liver, demonstrating the three main ligaments. The bare area of the liver lies between the anterior and posterior folds of the coronary ligament. The hepatic recesses are anatomical spaces between the liver and surrounding structures. They are of clinical importance as infection may collect in these areas, forming an abscess. Subphrenic spaces – located between the diaphragm and the anterior and superior aspects of the liver. They are divided into a right and left by the falciform ligament. 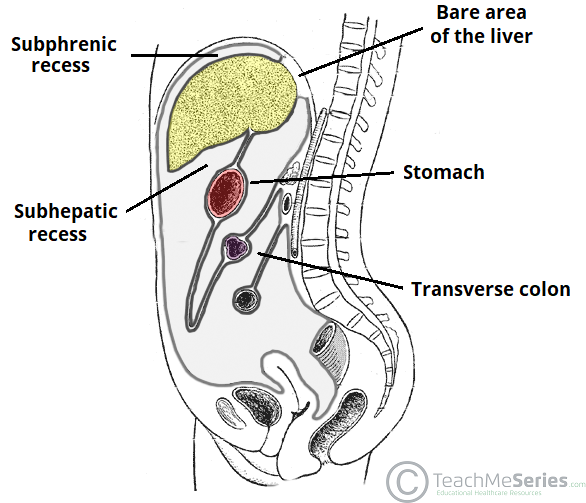 Subhepatic space – a subdivision of the supracolic compartment (above the transverse mesocolon), this peritoneal space is located between the inferior surface of the liver and the transverse colon. Morison’s pouch – a potential space between the visceral surface of the liver and the right kidney. This is the deepest part of the peritoneal cavity when supine (lying flat), therefore pathological abdominal fluid such as blood or ascites is most likely to collect in this region in a bedridden patient. Fig 3 – The subphrenic and subhepatic recesses. Note the bare area of the liver. The structure of the liver can be considered both macroscopically and microscopically. The liver is covered by a fibrous layer, known as Glisson’s capsule. Caudate lobe – located on the upper aspect of the visceral surface. It lies between the inferior vena cava and a fossa produced by the ligamentum venosum (a remnant of the fetal ductus venosus). Quadrate lobe – located on the lower aspect of the visceral surface. It lies between the gallbladder and a fossa produced by the ligamentum teres (a remnant of the fetal umbilical vein). Separating the caudate and quadrate lobes is a deep, transverse fissure – known as the porta hepatis. It transmits all the vessels, nerves and ducts entering or leaving the liver with the exception of the hepatic veins. 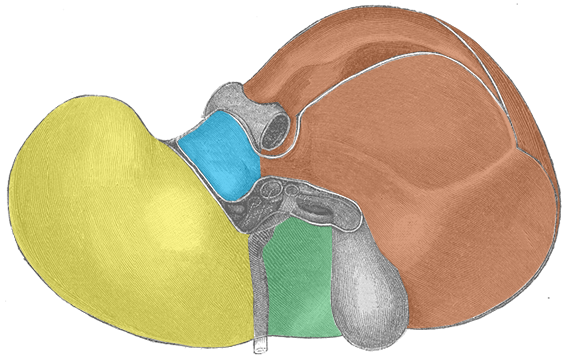 Fig 4 – The anatomical lobes of the liver. Microscopically, the cells of the liver (known as hepatocytes) are arranged into lobules. These are the structural units of the liver. Arteriole – a branch of the hepatic artery entering the liver. Venule – a branch of the hepatic portal vein entering the liver. Bile duct – branch of the bile duct leaving the liver. The portal triad also contains lymphatic vessels and vagus nerve (parasympathetic) fibres. 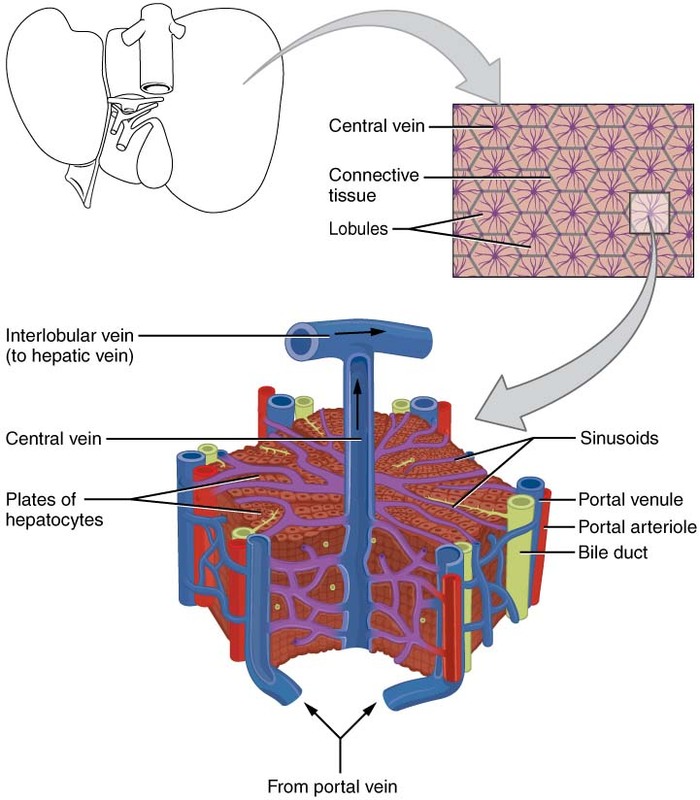 Fig 5 – The structures of a hepatic lobule. Hepatic artery proper (25%) – supplies the non-parenchymal structures of the liver with arterial blood. It is derived from the coeliac trunk. Hepatic portal vein (75%) – supplies the liver with partially deoxygenated blood, carrying nutrients absorbed from the small intestine. This is the dominant blood supply to the liver parenchyma, and allows the liver to perform its gut-related functions, such as detoxification. Venous drainage of the liver is achieved through hepatic veins. The central veins of the hepatic lobule form collecting veins which then combine to form multiple hepatic veins. These hepatic veins then open into the inferior vena cava. 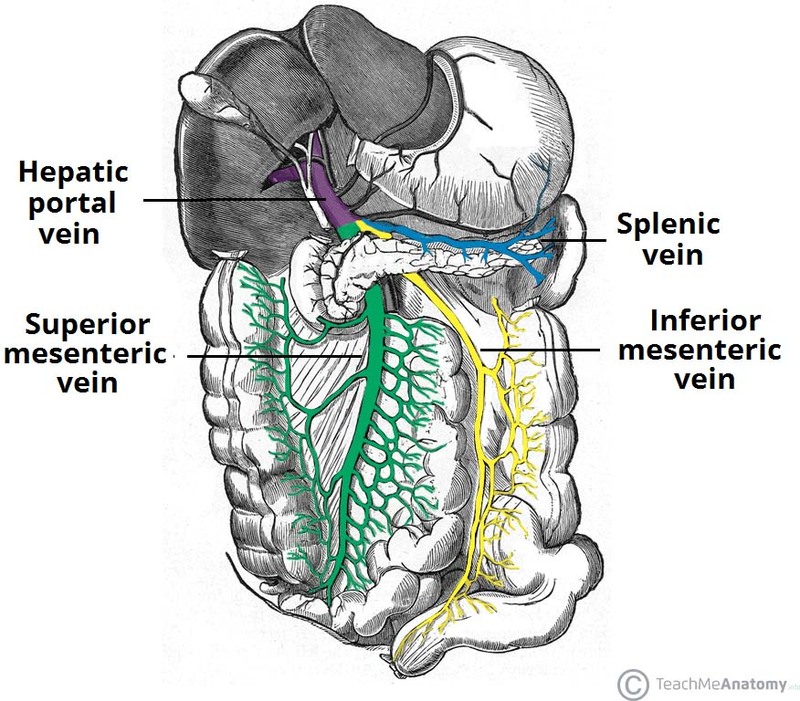 Fig 6 – An overview of the venous portal system – draining into the hepatic portal vein. The parenchyma of the liver is innervated by the hepatic plexus, which contains sympathetic (coeliac plexus) and parasympathetic (vagus nerve) nerve fibres. These fibres enter the liver at the porta hepatis and follow the course of branches of the hepatic artery and portal vein. Glisson’s capsule, the fibrous covering of the liver, is innervated by branches of the lower intercostal nerves. Distension of the capsule results in a sharp, well localised pain. The lymphatic vessels of the anterior aspect of the liver drain into hepatic lymph nodes. These lie along the hepatic vessels and ducts in the lesser omentum, and empty in the colic lymph nodes which in turn, drain into the cisterna chyli. Lymphatics from the posterior aspect of the liver however, drain into phrenic and posterior mediastinal nodes which join the right lymphatic and thoracic ducts. A percutaneous liver biopsy is procedure used to obtain a sample of liver tissue. A needle is inserted through the skin to access the liver. Abnormal LFTs of unknown cause. Hepatitis C – Assessment for severity of liver fibrosis and disease progression. Other liver conditions (such as Hereditary Haemochromatosis and Autoimmune Hepatitis). During the procedure, the liver is located via ultrasound. Local anaesthetic is injected on the mid-axillary line, where on percussion there is dullness. The patient is asked to deeply expire (avoiding damage to the lungs), and the needle biopsy is taken during held expiration. If a patient has abnormal clotting (a contraindication for the procedure), a transvenous liver biopsy can be attempted. This involves cannulating the internal jugular vein, and passing the biopsy needle through to the hepatic veins, allowing for a biopsy sample to be taken. Where in the abdomen is the liver predominantly located? Which organ does NOT lie in contact with the liver? Which lobe of the liver has been highlighted in green?